Campus Child Care with free childcare services, also in the afternoon and early evening. Founded in 1954 as the Medical Academy of Magdeburg (MAM), the university was incorporated as the medical faculty in the newly founded Otto von Guericke University of Magdeburg in October 1993. 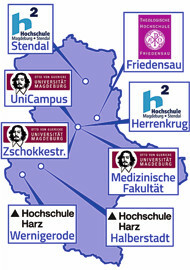 Currently, 21 institutes and 24 clinics belong to the Medical Faculty and the University Hospital of Magdeburg. About 185 students are enrolled yearly for a degree programme in human medicine. Magdeburg, the provincial capital, is a city with charm and life suitable for all generations! Apart from various cultural events and recreational opportunities, it can also offer much rest and relaxation as it is situated on the Elbe River and has many parks.